This is the first in a series of quinoa with roasted root vegetable recipes. If you don't know, quinoa is a whole grain that is sort of, to me, a cross between rice and couscous. It's very good, and it's one of the only plant foods that's itself a complete protein. I wrote this Livestrong article about vitamins in root vegetables, which are the vegetables that I will be using for this series. And also when I adapt this roasted carrot and avocado salad recipe from smitten kitchen. Trim the beet greens and save them for later, or saute them to serve on the side. I am not peeling my root vegetables anymore, just scrubbing them. I mean, obviously, peel the onion. 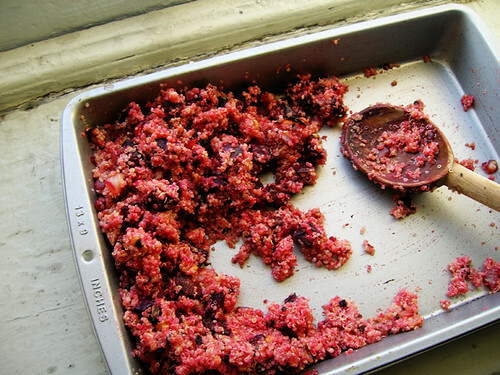 Dice the beets and onion and toss in a baking pan with olive oil, salt, and a little bit of thyme. Roast until nicely browned, about twenty minutes, stirring in walnuts halfway through. Meanwhile, bring the quinoa and water to a boil in a small pot. Reduce heat to low and cook for 15 minutes. Turn off the heat and let it stand. When the vegetables and nuts are roasted, add the quinoa right to the baking pan and stir it all together. I kind of think this would be good with a side of sauteed spinach, which is why I said about the beet greens.